Are you familiar with Callibaetis, the gray ghost of summer? Callibaetis are one mayfly that I look forward to each year, and when they appear I can be assured that trout will soon be actively feeding. 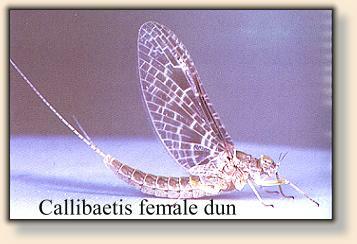 Callibaetis are common insects on western waters especially on lakes and ponds. They also are found on slower weedy sections of rivers, but they reach their greatest numbers on stillwaters. On productive waters they hatch in tremendous numbers with densities that match the blanket hatches of caddis flies and midges. Callibaetis are multibrooded, and produce up to four broods per year. Peak hatches take place in May and June, August, and again in September. During the warmer months nymphs may reach maturity in five weeks. Once they begin to hatch it is usually possible to find some insects hatching every day until the season ends so the fish are always aware of their presence and willing to feed on them if the opportunity presents itself. Anglers should note that Callibaetis get smaller as the season progresses. The earliest hatching flies are noticeably larger than the flies that hatch at the end of the season. I carry imitations that range from a size 14 to 18 to cover the size variation that I find on the waters around my Montana home. The nymphs are very active, and have slender, tapered bodies. They have three tails that are equal in length and fringed with tiny hairs, and the gills are heart-shaped. They are active swimmers, and if you look around weed beds you will often see them darting about with burst of activity. Anglers should be aware that both the nymphs and adults show a remarkable variation in body color from one place to another, and even from one month to the next. It appears that the nymphs take on the color of their surroundings, and the nymphs that over winter under the ice are usually drab-colored, but with the warming of the water and increasing weed growth the nymphs become more colorful. Adults also vary widely in body color, and like the nymphs their color changes during the season. I have found that the adults that hatch during the midsummer here in Montana are the lightest gray, while the early and late season insects are a darker gray. Successful anglers note these changes in size and color and have patterns that more correctly imitate the hatching insects. Callibaetis nymphs should be tied long and slender to imitate the naturals. Tiers should be aware that the thorax is a pronounced feature of the natural, and should be emphasized on their imitation. Fishing a nymph just before the hatch begins is often a very productive method. The naturals become very active just before they hatch repeatedly swimming to the surface and back to the weeds. They usually dart to surface rapidly and then drift back down to the weeds. I like to use a lightly weighted nymph cast just off the edge of the weeds during this period. I allow the nymph to sink and then I slowly lift the rod tip bring the nymph to the surface. A weighted nymph fished deep with a short stripping retrieve around the edge of weed beds is productive when adults are not actively hatching. During the hatch of duns one of my favorite fishing methods is to select a position just off the edge of large weed bed where the duns are actively hatching. The lakes that I fish have very clear water and I can normally see the trout cruising along just under the surface looking for hatching insects. When I locate a cruising trout I quickly cast my imitation a few feet ahead of him. The sight of my imitation dropping on the surface of the water is often just the stimulus that the trout needs to tip up and sip in my offering. 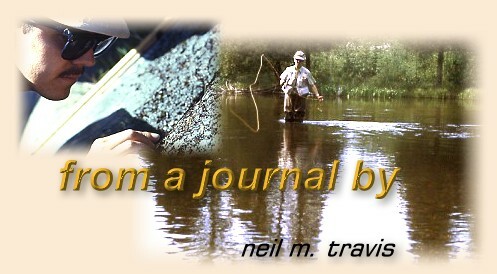 Another productive method is to slowly drift along the edge of a weed bed casting to cruising trout as they gulp in the naturals. This can be frustrating as a large trout sips a natural bobbing just inches from your imitation, and then changes direction and swims the other way. 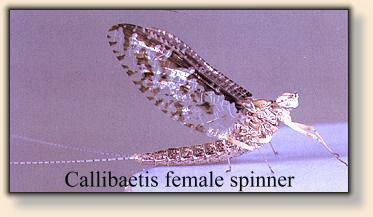 Often the first indication that Callibaetis are present is a spinner flight. The males gather over the water, and their flight is a fast, vertical series of undulations over the water and nearby areas. I have often witnessed heavy spinner flights some distance from the nearest water. After mating the females rest in the trees, shrubs and grasses allowing their eggs to ripen. When the females return to the water to lay their eggs they dip the tip of their abdomen into the water, and since the eggs have been allowed to ripen in the body of the female they hatch very shortly after ovipositing. As the hatch progresses it is not unusual to find both duns and spinners on the water at the same time. Although I have seldom found actively feeding trout to be selective during these occasions, eating both duns and spinners as the opportunity presents itself, the angler should be aware that some individual fish may be selective preferring duns or spinners. On one occasion I found that the trout near the weed beds were only taking duns, but down the shoreline away from the weed beds they were only taking spinners. Like the duns, spinners are larger in the spring than later in the season. As the spinners decrease in size trout will sometimes completely ignore the spinner fall, and only feed actively on the duns. A cloudy calm day early in the season with a heavy spinner fall may produce some of the finest stillwater fly-fishing of the year. Large trout are often caught using Callibaetis imitations, and anglers should use the heaviest tippets possible to avoid breaking off in the weeds. I normally try to use 4x tippets when fishing near the weeds only going to 5x when I consistently get refusals.